This is a cute dog who has an opening at the back of his head where your hand goes in and his mouth opens and shuts. He is a dog hand puppet. There are no tags or makers mark on him, but he is reminescent of the vintage 1981 Wrinkles dog puppet by Ganz Bros. 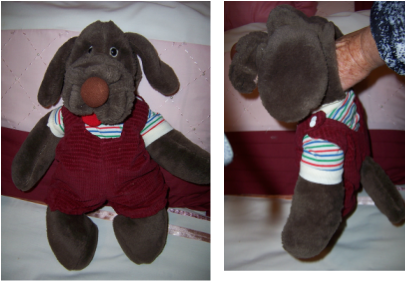 He has brown fur, long brown ears, long red tongue, black plastic eyes, large brown fabric circle nose, 4 legs and a tail which sticks out of the back of his maroon corduroy overalls.
. one of his poppers for his overalls is not working, and a press stud has been sewn on to replace it underneath.
. clothing has no tags on it. 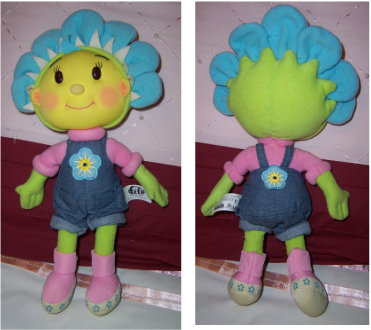 Fifi and the Flowertots was a British animated childrens television series. It featured a group of flower based characters and their adventures and activities through the garden. Our soft toy is called Fifi. 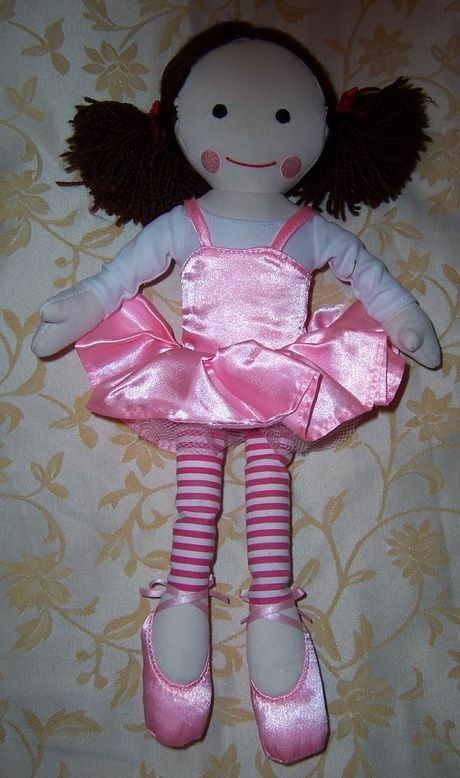 She is dressed in her original clothing which is non removable, and still has her original cloth tag to her body which shows she was an official toy from Chapman Entertainment 2004. 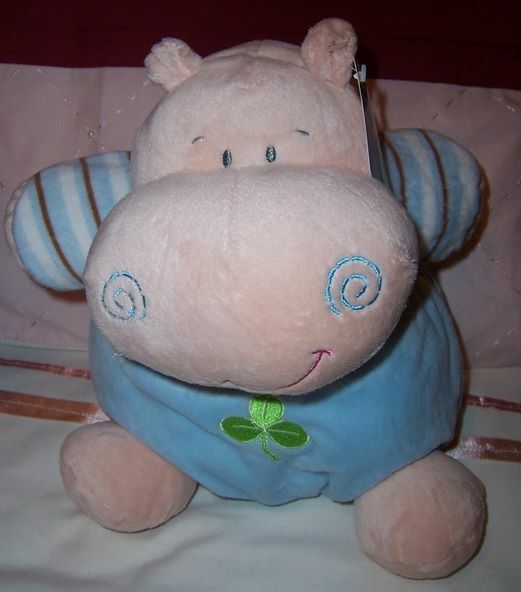 Hippo is extremely light, soft and cuddly and is a Tommee Tippee Shake Toy which features a gentle bell rattle for the baby to hear, and also has a squeeker in his bottom paw. Hippo appears to be in almost brand new condition, and still retains his original paper tag to his ear, and has his cloth tag to his bottom. A gorgeous soft toy for your little one to love and hold, and take to bed to cuddle throughout the night. Hoot is the owl characters from the extremely popular ABC Kids show called Giggles & Hoot. He is a soft plush toy which are very soft and cuddly. Hoot comes with his ABC circa 2012 (very hard to read date) hang tag to the back. He is still very bright and colourful - lots of fun. 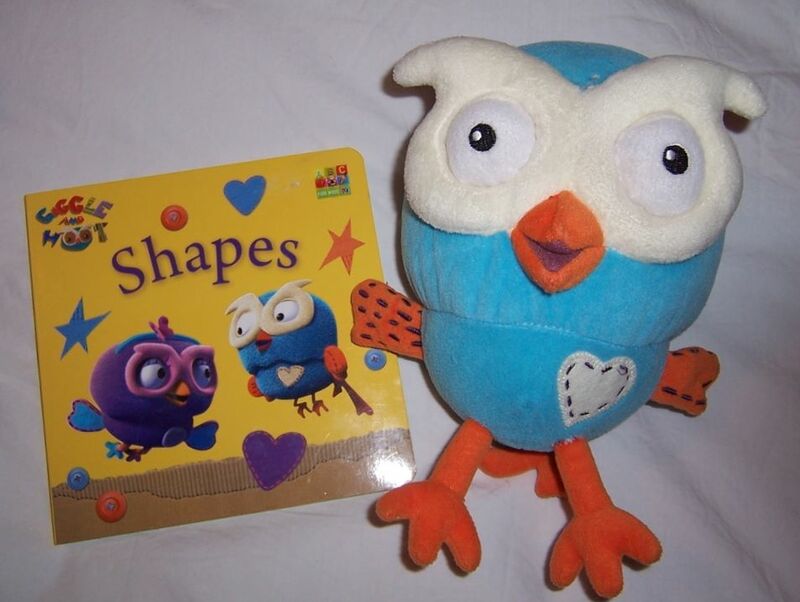 We also have a Giggle & Hoot cardboard hard book called ''Shapes''. This has all the characters in it from the show. A lovely lot of Giggle & Hoot items. Alice in Wonderland is always a very popular Lewis Carroll story for the young child. A topsy turvy cloth doll is a great way to engage the child in the story. As you tell the story you have your doll helping you visually. You have Alice in Wonderland , in her traditional blue and white dress, tip her over and you have Queen of Hearts in her red dress, crown ,royal sceptre and then turn her around and you have the wonderful Mad Hatter. The White Rabbit and Cheshire Cat are on velcroe and can be removed. 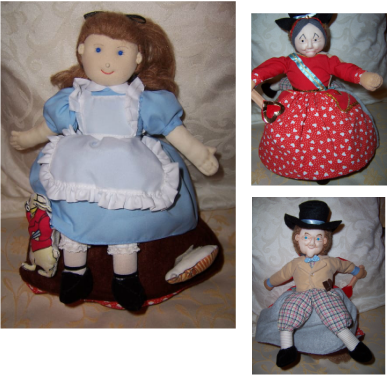 The faces of Alice, Queen, and Mad Hatter are made from stockinette, and are just wonderful in detail. This would be a great item to have for Primary Schools, Kindergarten, and Child Care Centres as well for Storytime. We believe this item is made from a company in Northern Ireland called ''Fun to Learn'', and is available brand new online for 25.00Pounds. "In the Night Garden" is a very popular childrens TV series. -lots of colourful pictures with the favourite characters of the Night Garden. Jemima is a soft and cuddly toy made by Jasnor on behalf of the childrens ABC TV show "Playschool" 2014. Here is Jemima in her ballerina costume.
. pink dress can be removed.
. legs are pink and white striped leggins and pretty pink ballet shoes. .eyes, mouth and pink cheeks have been machine stitched.
. hair is brown wool tied into two pig tails with red hair ribbons (a little pilling at the back - see photos). She is in lovely preloved condition.